NOTE 1 – Raw almonds are quite mild tasting, so if you want a more almondy taste in the cake, you could add some almond extract. NOTE 2 – If you would prefer these with a frosting, I suggest a cream cheese frosting, of the type you might use on a carrot cake, would go well. 2. Chop up the almonds. 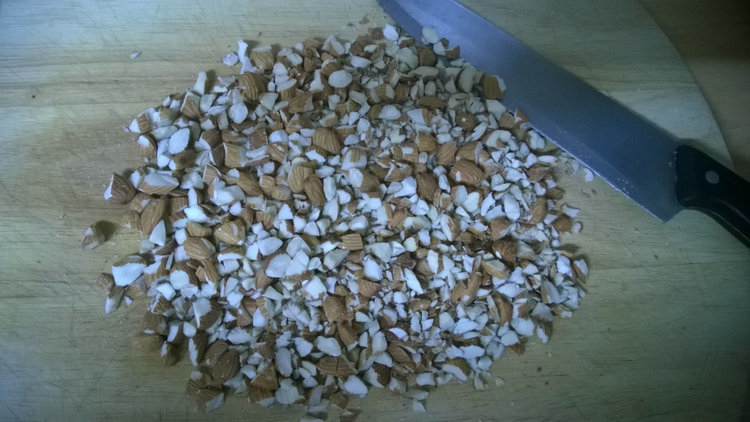 I like them roughly chopped so that you get big chunky bits of nut in there, but you can obviously chop them finer if you prefer. You could also buy ready chopped nuts, but I find they taste fresher if you buy them whole and chop them just before use. 3. Place the butter, honey and sugar in a pan. Melt slowly over a low heat, stirring. When it has all turned to liquid, increase the heat and boil for about one minute. This is where the lovely aromas start, hot honey and butter, mmmm…. 4. Remove the pan from the heat and stir in the chopped almonds. Leave to cool for 15-20 minutes, the heat will start to soften the nuts a little. The cooling of the liquid is important to avoid scrambling the eggs when you add them. 5. 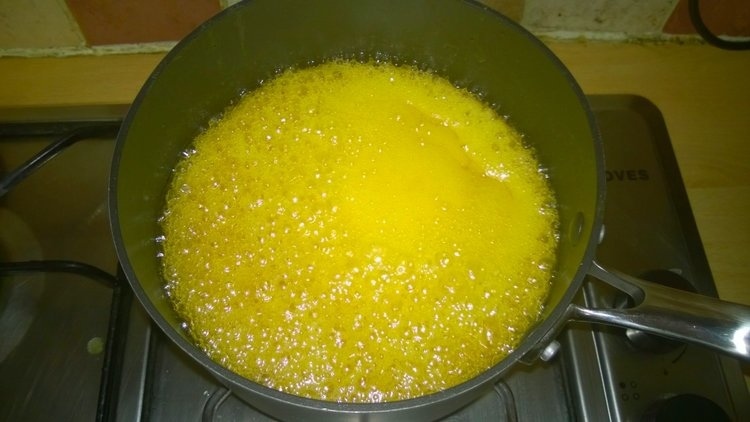 Add the the beaten eggs into the melted honey mixture and beat with a wooden spoon until well combined. 6. Sift the flour into a large bowl, pour in the egg and honey mixture. Stir and then continue beating with the wooden spoon until smooth. 7. Divide amongst 24 cup cake cases. 8. Bake for 20-25 mins until springy and an inserted cocktail stick comes out clean. 9. Place the cakes on a cooling rack. Warm approx 4 tablespoons of honey in a pan or the microwave. Brush the honey over the top of the cakes (this works best if the cakes are still warm). If you are planning on frosting the cakes, then no need to do the honey glaze. The cooked and cooled cakes will keep for about 4 days in a suitable container, or can be frozen. Honey. Oh my, and almonds too. They’ll be all gone before they cool down. Sound yummy. Well yes, and with all that rising in the oven, they’re pretty much all air right? They look so moist in that bottom picture. Yum! Yes, the nice honey glaze helps with the look! The funny thing is, I’m not actually a big cake-eater, I just find baking quite therapeutic, and I like trying out different methods that I come across, almost more with a scientific interest about how it comes out depending on the different quantities and differing methods of making, but often I might only have one out of a batch I make! I do the same as you when I have a cold, but with the addition of a piece of ginger root – whether it actually does anything to help the cold is debatable, but it’s soothing and that counts for a lot! 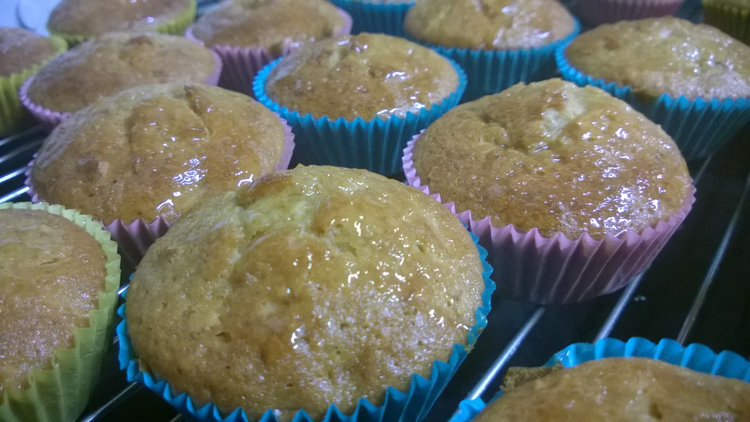 The honey is the prominent taste in these cupcakes and the nuts add some nice texture. Yes, it may be a psychosomatic healing effect. Just as likely, it’s the increased fluids. But, boy, does it make me feel better! I’ll have to remember the ginger, too. Yes, can we have some more please? Actually there are more in the freezer!